Last month, more than 200 gravestones appeared in the Mediterranean Sea, about 200 meters off the Aegean coast of Turkey. Made of waterproof styrofoam that resembled marble, and anchored with weights, each stone bore the name of a Syrian refugee who died in the water while trying to reach Europe. 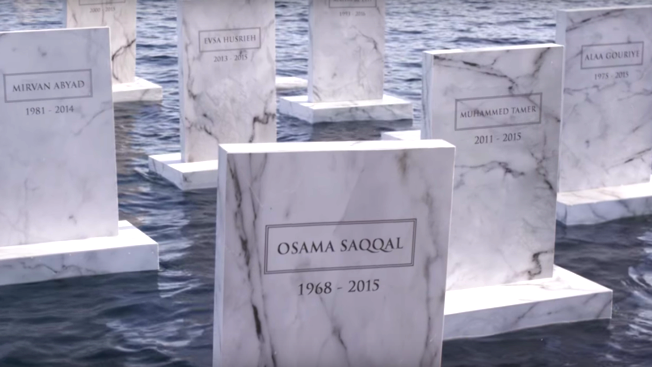 Created by TBWA\Istanbul for humanitarian aid group Support of Life, the "Sea Cemetery" bobbed on the waves like a cluster of buoys, eerie monuments to human tragedy. "Support to Life loved the idea of an elegant artful installation, instead of a hard-core political expression," İlkay Gurpinar, chief creative officer at TBWA\Istanbul, tells AdFreak. "It's a touchy subject, and they wanted to touch the hearts of people in a visual and tender way." Some 4,000 Syrian refugees have died attempting to cross the Mediterranean since the Syrian civil war began five years ago. Lately, "people have started to lose interest and started perceiving this as only a political matter, rather than a matter of life," Gurpinar says. "Through a symbolic memorial for people who have lost their lives at sea, we wanted people to empathize with the situation and take it more personally. That's why we contacted actual refugees who have lost their loved ones in midst of their journey to freedom." Creating the installation was "a very long and tough process with lots of planning involved," Gurpinar adds. "The diving team was underwater for over 18 hours," securing the memorial to concrete blocks at a depth of 25 meters. "Since it is one of the real locations where many refugees have lost their lives [near Kas, across from the Greek island of Kastelorizo], the municipality knew about the serious nature of this issue and they supported us," she says. The resulting online film sends users to TheSeaCemetery.com, where they can learn more about the refugee crisis and make donations to Support of Life. "At a time when this part of the world has started to normalize the issue, the project reminds us that this is one of the biggest disgraces of the century, and reminds people not to normalize it," Gurpinar says. "This is not about politicians. It is about real people like all of us who are risking their lives for the hope of having a future. In the end, we wanted people to feel this and take action."